CEO Eric Schmidt has weighed in on the Bing launch — and he’s not sounding panicked, not that I would expect him to be. But he certainly puts out a conflicted message that Bing isn’t a serious competitor and yet argues that it’s serious enough that talk of a Google monopoly seems “unwarranted.” Plus, a somewhat passionate message that Microsoft can’t expect to buy its way into search share. A look at his interview with Fox. Schmidt: It’s not the first entry for Microsoft. They do this about once a year. Well, maybe every two years. In 2005, Microsoft pushed MSN in a big way. Fairly soon after, things morphed into Live Search with a more limited push. We’re two or three years past, and it’s a major new brand that Microsoft is putting out there. Somehow, it still feels a bit different than what they’ve done before. I guess it’s a sense to me that this is the dice being thrown down the table for the final time. Whoa. This is the same Eric Schmidt who has repeatedly said over the years that Google constantly has to fight to win its search share, since users are only “a click away” from switching. But now it turns out that it’s hard for Microsoft to copy Google’s key components. Well, if that’s what search is about — and if Microsoft can’t match it — fair to say Google’s not really in danger of losing its audience in a flood of clicks — and it can stop trying to push that message. Hang on to that thought. Will Google hang on to the number one position? “I certainly hope so,” Schmidt said, touching on Google being innovative, that’s there still lots of work to do and technology to deploy. Schmidt: We are spending all of our time on exactly what we’ve always done, which is innovation. I don’t think Bing’s arrival has changed what we’re doing. We are about search, we’re about making things enormously successful by virtue of innovation. Techmeme is beginning to collect stories of people talking about tips and tricks on using Bing. Some of these aren’t unique to Bing; other search engines offer them, as well. But one good part about the Bing launch is that as people explore it, they’ll rediscover things that search engines generally can do but which are often overlooked or not realized by even tech-savvy people. Apple co-founder Steve Wozniak is a case in point. After seeing the Bing demo, he found it “astounding.” Trust me, Google could do a product demo of its various services that would blow his mind. Problem is, they don’t. 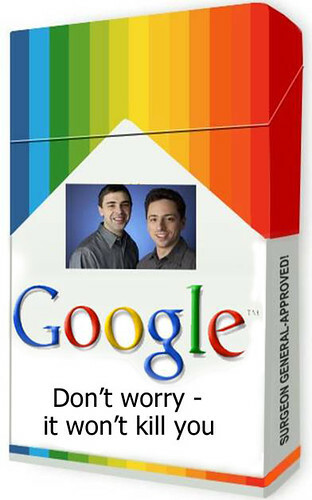 Google’s never really had to market itself to consumers, to trot its stuff. The recently held “Searchology” event didn’t cover anywhere near the range of what Google offers. But if the praise for Bing keeps largely rolling in — if people keep discovering features that aren’t necessarily unique to Bing — Google may find it has to step up. And Yahoo, too, could do a demo of its services that would blow people’s minds. But then again, Yahoo’s not a search engine anymore, I hear. Schmidt: Yahoo is different strategy than Google, and she articulates it in that context as well. Google is really about getting all the information and organizing it for you. Yahoo is a different strategy. We think ultimately Bing will evolve to a different strategy as well. Yep, Bartz has been playing a different strategy — that they’re not a search engine, as my Bartz Continues Torpedoing Yahoo Search post gets into more. But Google offers many of the same features that Yahoo does, so they’re not so different as either CEO makes out. They compete for many of the same users in areas outside of search. As for Bing, they think they ARE evolving a different strategy with the entire “decision engine” thing. They’re not to me (as State Of Search: Google Will Stay Strong Despite Bing & Yahoo explains more). Perhaps Schmidt doesn’t see Bing as different as Microsoft thinks it is. Schmidt: We like the fact that there are all these search choices. It’s a very competitive market. Any time that Microsoft causes a merger or acquisition or deal and restricts choices, it’s a bad outcome for customers. Well, anytime anyone does a deal that restricts choices, I guess it would be a bad outcome. And Google’s done plenty of its own (see Hey Firefox – Let Us Pick Our Own Search Engine! for one example). Need another? It’s native to upload photos in the latest Android photos out there to Google’s Picasa. But Flickr? Better go find a third-party app. Schmidt: But you earn that. You don’t just buy it with ads. You earn it, and you earn it customer by customer, search by search , answer by answer. And we believe that today we beat our competitors because we’re so focused on comprehensiveness, speed, freshness and having the depth that people really care about. Schmidt sounded a bit passionate — maybe irritated? — to me on the earn it part, almost as if folks at Google have been watching the Bing adfest that’s been running and wondering if folks need reminding that it’s not all about marketing. I agree. Google has earned its place (see The Google Hive Mind). That’s not to say it hasn’t bought ways to help it gain. It’s estimated to have spent more than $1 billion in distribution deals over the years. I don’t think those distribution deals would have worked in the long-term, if it wasn’t that Google also provided a quality service. Google couldn’t buy the love, but it certainly was able to buy a lot of first dates. Plenty of same clever ideas of search overload or irrelevant results (especially see the HotBot ad — “he shows up for everything”). Clever without quality underneath doesn’t help. Schmidt: I would offer Bing’s arrival as proof of the competitive of the market. Schmidt: Google is literally one click away. Since Bing’s arrival, for example, people have been switching to try it, and then they switch back. It’s very easy to switch from one to the other. In many of these other markets, that’s not true. In our case, its’ so competitive, I think these concerns are completely unwarranted. Wow, what a 180 degree turn within a 5 minute interview. Bing — not a challenge to Google — now is. I felt like I had to verify my Bing results with a Google search. Bing was my default in the browser, but the trust wasn’t there. Microsoft’s challenge is pretty clear: Marketing may get you to try Bing, but will you trust the results? Simply put, any lingering Bing buzz I had wore off. Well put. I’ve been forcing myself to use Bing as part of the evaluation process, as well — and I also feel I want to trot back to Google to see if I got the “right” answer. But sure, Google’s a click away. Still, it’s not like Google forces the consumer to search with it. And what’s the Department of Justice going to do if Google gets to a 90%+ share naturally through consumer choice? Cause Google to send people randomly away? Really, I expect the legal fight ultimately to move away from consumer share and more into an area about whether Google simply has control of too much of the internet ecosystem. Fights In The Google Monopoly Debate Miss Key Points discusses this more. For related coverage, see Techmeme.